We’ve discovered over a thousand exoplanets and characterized many of their properties. We’ve also discovered and studied the birthplace of planets: protoplanetary disks of gas and dust surrounding young stars. While many of the details of the planet formation process remain to be figured out, we can check if there is enough material in protoplanetary disks to form the planets that we’ve discovered. The authors of today’s post do just that, and come to some interesting conclusions about how quickly planets start to form. Figure 1. 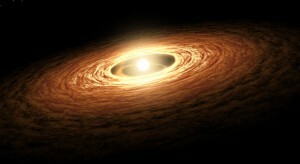 An artists conception of a protoplanetary disk. Image from NASA JPL. While protoplanetary disks consist of both gas and dust, the authors only consider the budget of dust (solid material) when making their comparison. The amount of gas is more difficult to measure, and much of it is known to be lost as the disks dissipate. The authors take a mass census of the protoplanetary disks in the Taurus-Auriga complex, a giant molecular cloud and a cluster of stars that are just a few million years old. The masses of solids in protoplanetary disks are typically measured from radio or sub-mm wavelength light that is emitted from the dust in these systems. The authors focus on class II disks, which are generally regarded as the birthplace of planets. 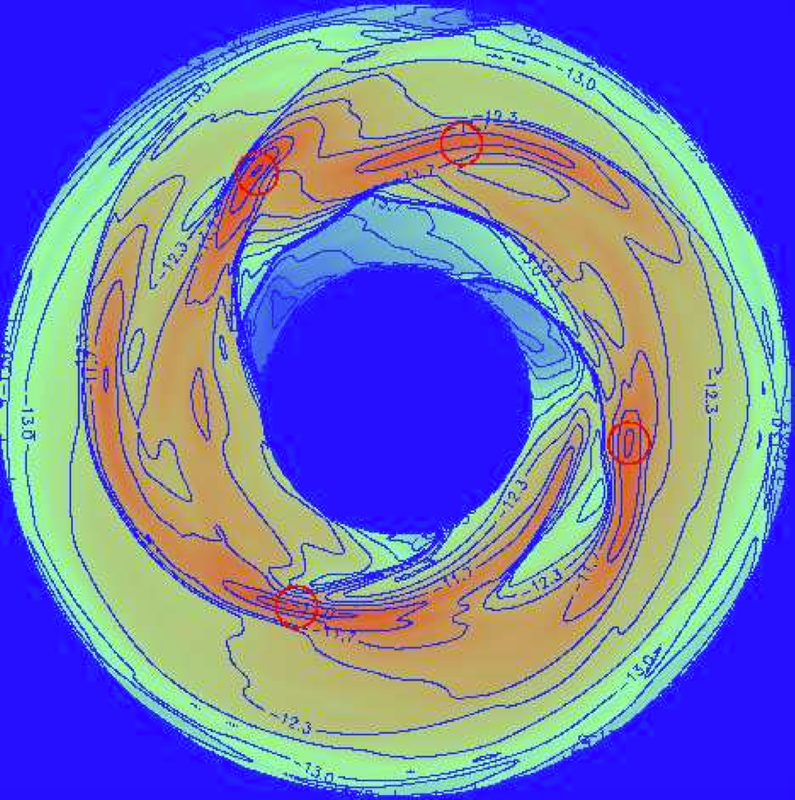 Class I disks (which precede class II) are short lived and are surrounded by envelopes of material that are still feeding the disks and protostars. Class III disks (the final stage in protoplanetary disk evolution) have already lost much of their material. To determine the mass budget in mature planetary systems, the authors account for solid material in the form of Earth-like and super-Earth planets, the cores of gas giant planets, and debris disks (which consist of material ranging in size from dust to km-scale planetesimals). The frequency of different types of planets is derived from the results of the Kepler mission and various radial-velocity, microlensing, and direct imaging surveys. These planet detection methods are sensitive to different orbital regions, so their results are complementary when attempting to sum the total mass of planetary systems. The frequency of debris disks is derived from surveys with the Spitzer and Herschel space telescopes, which detect the infrared light emitted from the dust grains in debris disks. The authors use the observational results to generate a simulated population of planetary systems using a Monte Carlo technique. The distribution of the total solid mass in these simulated planetary systems is shown in Figure 2, along with the distribution of solid mass in the observed protoplanetary disks. The figure is in the form of a cumulative distribution, where the x axis notes the mass of solids and the y axis notes the fraction of systems in the population having this mass or greater. So is there enough mass in protoplanetary disks to build the planets and debris disks that we’ve discovered? These authors conclude that there is not. You can see this in Figure 2, by comparing the green or cyan lines — which represent slightly different versions of their simulated population of mature planetary systems — with the black lines — which represents the observed distribution of class II protoplanetary disks. At less than 20 Earth-masses the black line is below the green/cyan lines, meaning there are not enough disks in this mass range to account for the observed planets. Above 20 Earth-masses, however, there are enough disks to build these planetary systems. The authors note that their conclusion is conservative, as they likely underestimated the solid content of planetary systems in their budget. First, they note the many planets exist that cannot be detected and counted by current planet detection techniques. Planets smaller than the Earth are extremely difficult to detect by any technique, and direct imaging — the only method sensitive to planets are very large orbits — can currently only detect planets with masses of at least several times Jupiter’s mass. Second, the process of planet formation is likely inefficient, with much of the leftover mass of small solid particles being lost from the system as the protoplanetary disk disperses. Gravitational interactions among fully formed planets likely send some planets crashing into the star while ejecting others from the system. The authors do find a solution to the problem of insufficient mass by examining Class I protoplanetary disks. The solid mass distribution of these disks is shown in violet in Figure 2, and they clearly provide sufficient mass to build the planetary systems of all sizes. This means that the planet formation process must start very quickly, with dust already beginning to coalesce into planetesimals during the brief class I phase. Once solid mass is locked up in larger bodies like planetesimals, it is hidden from observations of protoplanetary disks, which explains why the class II disks appear to have much lower masses (the decrease of solid mass from class I to class II disks could have alternatively been explained by material falling onto the star or being ejected from the system by jets). The mechanism of planetesimal formation is still debated by theorists, but these results lend strong support to those theories that can build planetesimals quickly. Figure 2. 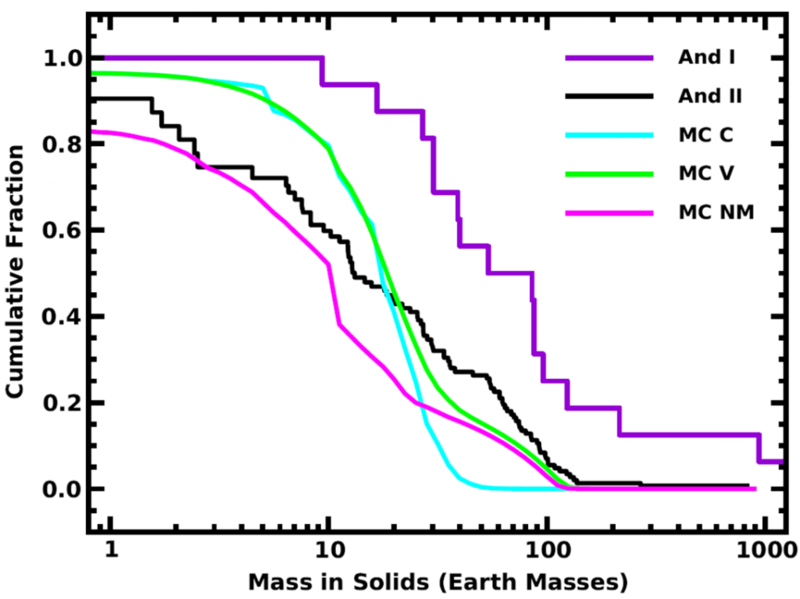 The cumulative distributions of the mass of solids in protoplanetary disks and mature planetary systems. The x axis is the mass of solids, and the y axis is the fraction of systems in the population with this mass or greater. Green and cyan: results from two versions of the simulated distribution of mature planetary systems. Magenta: the same simulations but with the microlensing planet results excluded. Black: the observed distribution of class II protoplanetary disks. Violet: the observed distribution of class I protoplanetary disks. I am a graduate student in astronomy at the University of Arizona. My research interests include debris disks, planet formation, exoplanet detection and characterization, and astrobiology. Currently, I am working with George Rieke to study the structure and evolution of planetary systems using observations of debris disks. I graduated from the University of Wisconsin in 2008 -- go Badgers!